The meeting was hosted at the Stadium hostels hall, Brookfields in Freetown. Director General of SLEWRC, Dr. Emmanuel Mannah, said the purpose of the meeting was to create the enabling environment for effective regulation, market entry and participation in the electricity and water sectors, and to ensure that they get the views of the public, as well as companies on the draft electricity and water regulations. He said the regulations shall ensure that current electricity service and water service providers improve on their systems and deliver their services in accordance with international best practices. The Director General said the commission was established by the virtue of the Sierra Leone Electricity and Water Regulatory Commission Act of 2011. “Our mission is to regulate the electricity and water industries in accordance with government laws and policies, standards and international best practices in support of sustainable and orderly development. Our vision is to be recognised as world class leaders in water and electricity regulation,” he said. He noted that their ultimate goal was to facilitate an understanding for the regulatory framework amongst all stakeholders for improved electricity and water services to consumers. He said their mandate is to regulate the utility service providers in the electricity and water sectors for the people of Sierra Leone. The Director General said electricity and water are very much important because people need them, therefore they should maintain good drinking water and the supply of 24 hours electricity for the people across the nation. He advised people not to destroy any pipe and cables, if they really want those services. Representative from civil society, Ibrahim Tejan Kelleh, said they work with different people from the government, hence they were ready to working with SLEWRC in the public consultations on the draft electricity and water regulations. Commissioner of Electricity and Water Regulatory Commission, Ibrahim Kabia, said consumers have basic rights which no one can take away from them. He noted that it is the right of the people to have electricity and good drinking water for them to live a happy life. 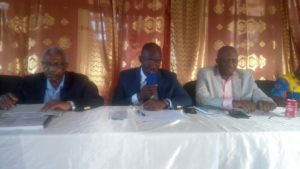 Head of Electricity Department at SLEWRC, Kelcise Sesay, said the commission has provided guidelines on rate chargeable for provision of electricity and water services to various companies working in the utility sector. He said they have also set up a platform to protect the interest of consumers and providers of electricity and water, and that they monitor the standards of performance for the provision of electricity in the country.